A non-contact voltage tester is the safest way to make sure the power is off without touching any wires. this is where the non-contact voltage tester comes in handy. The tester will light up and/or make noise when it comes close to a hot (live) wire, even one that's covered in plastic insulation. Note that it can't test through metal conduit or metal sheathing. Before using the tester, check its batteries the easy way: by shoving the tip into a live electrical socket, or holding it against the cord or bulb of a lit lamp. You'll hear continuous chirps or see a series of flashes to confirm the tester has detected voltage. 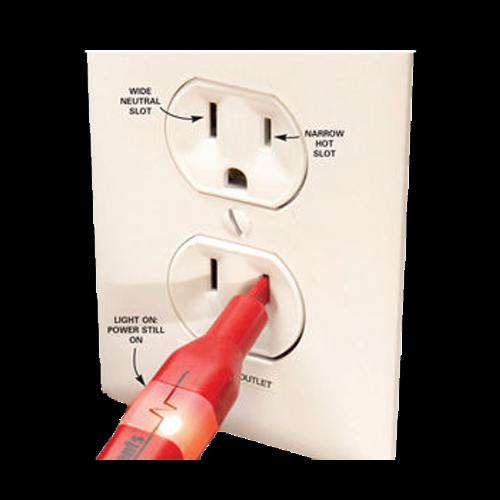 When testing a receptacle, just put the tip into the smaller (hot) plug slot. Of course, it's always good to check the larger (neutral) slot in case the receptacle was miss-wired, Make sure you've checked all slots in the receptacle in case they were wired differently or on different circuits, and if the receptacle is connected to a wall switch make sure the switch is on during testing. After you unscrew the receptacle, pull it out and directly test all the wires again to confirm they're not live. It's also a good idea to test any other wires reachable from the back of the receptacle. When testing a power switch, unscrew and remove the cover plate then place the nose of the tester against the screw terminals on the side of the switch. Once you confirm the wires aren't live, it's safe to unscrew the switch and continue testing other wires in the box. When testing a light fixture, turn the circuit off at the main panel, and ensure the light switch is turned on. Then unscrew the light bulb, and place the nose of the tester onto the center socket button. If the light has two switches (on a three-way switch), test with one switch in both the up and down position. Once you've confirmed the fixture isn't live, it's safe to unscrew it from the electrical box, pull it out, and test any other wires you see.